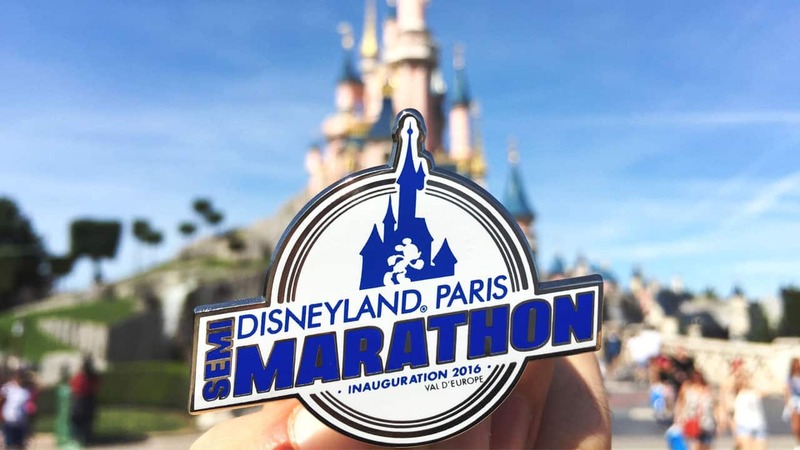 The Inaugural Disneyland Paris – Val d’Europe Half Marathon Weekend is only a few weeks away. 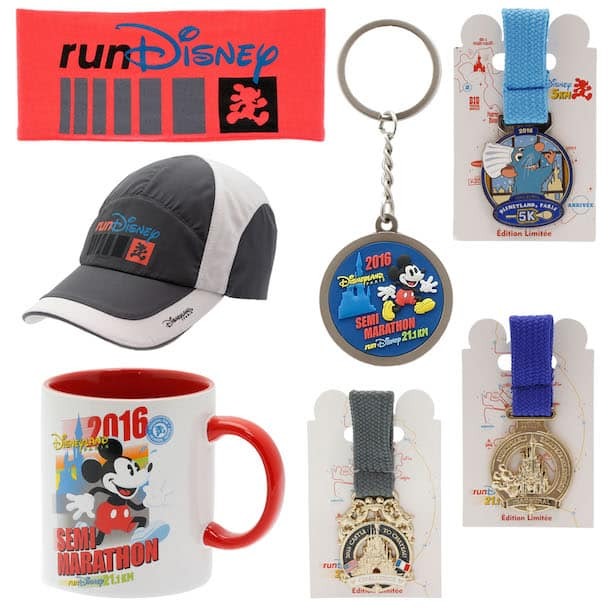 This exciting runDisney event will take place from September 23-25, 2016. Today, I have a look at some of the commemorative products that guests will find during the upcoming magical weekend. 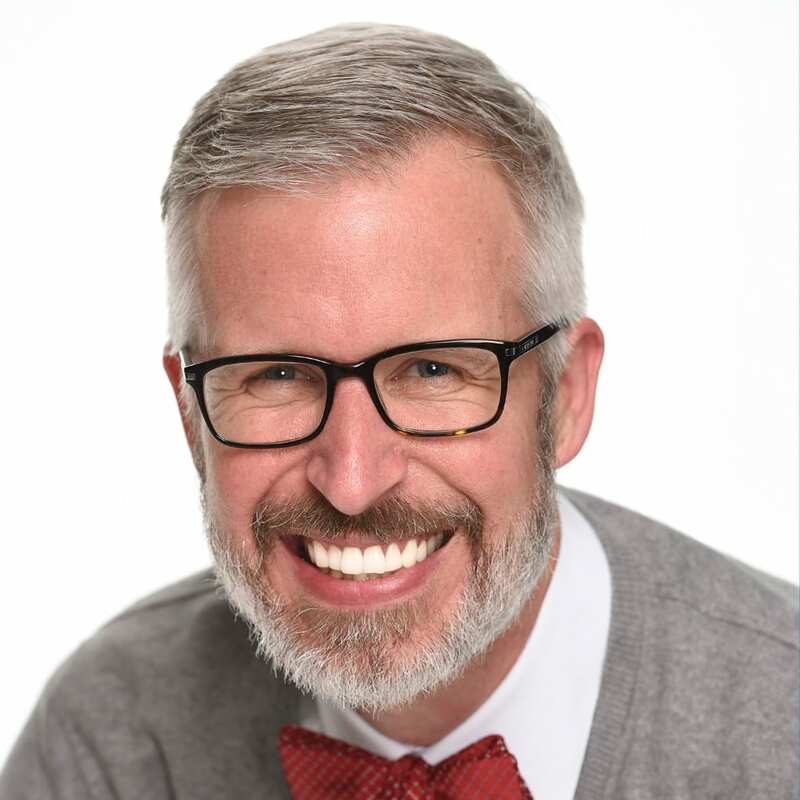 Guests attending this Inaugural event will find a variety of shirts for women and men. Several of the shirts were made with performance fabrics and contain details like mesh cutouts. 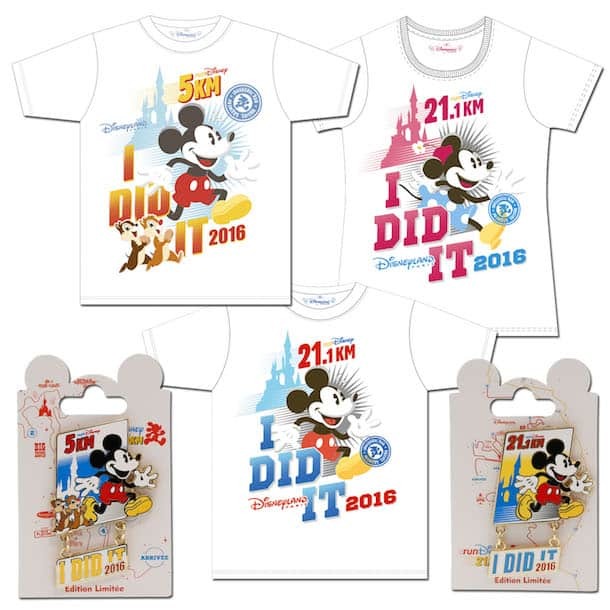 We will also offer “I Did It!” shirts and limited edition pins celebrating the 5K and Half Marathon races. Other items in the event assortment will include limited edition replica medal pins, a mug, a hat, a key chain and a headband. Finally, the Disneyland Paris team paired up with renowned French designer Barbara Rihl to design a unique handbag that celebrates the weekend. The leather shoulder purse is sprinkled with running-themed details. Barbara’s arty universe blends perfectly with dreamlike Sleeping Beauty Castle and Disneyland Hotel. 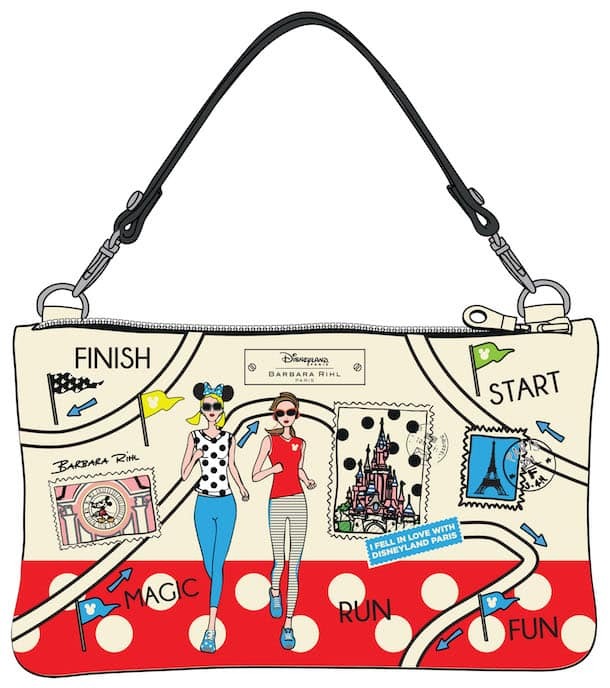 The purse also includes a glimpse of the Eiffel Tower, and a nod to Minnie Mouse’s legendary red polka dot print. Quantities for this item are limited and will be available while supplies last. The purse will have a retail price of €150. Look for these items from September 22-24, 2016 at the runDisney Health & Fitness Expo held in the Disney Events Arena located at Disney Village. I was very dissappointed they ran out of the 5k commerative pin, I wasn’t able to get one and I checked on both thu & Fri in the event arena store. Also as I look at this, the Half pin I got was completely different than the one pictured here! I really like the one pictured and prefer it to the one I was able to get. Not that I wanted one, but as I look at this I also don’t recall seeing those commerative look alike medals being sold at all? Very dissappointed in the memorabilia offered. I saved really hard to make this Half my very first Half. I can not find the race photos that were taken during the event. Any help on where they are located?? Great Race.. fun to be running outside the formal park area…. Is there any way to get the purse now? We got to the expo about an hour after it opened, and the purses were completely sold out! So bummed, but hoping that you’ll allow us to order it (esp. if we have proof that we ran the race). I noticed that many people that didn’t run were at the expo buying merchandise. I know in the past runDisney events you have offered select merchandise for sale when you run out and an event. I see several people are disappointed theat you ran out of the collectible pins. Any chance you would be offering these for sale online? The staff have been amazing! I’m disappointed that the badges for the 5k ran out before attending on Saturday (we went straight to the Expo off the Eurostar) and I am hoping that they will be made available online. Its disappointing because Disney have always promoted the pin badges. We were offered the 10k ones.. But we are running the 5k as our first RunDisney. @Stephanie the Mini medal pins are at the Expo but at the registers. You need to ask the CMs at the registers for them. They were running low when my friend went. I was really hoping for the Mickey head car magnets! Is there any news if the RunDisney New Balance trainers will be available? @Adam – The runDisney New Balance trainers will not be available during this event. Love Barbara Rihl Disney bags! Wish they were sold in the US parks!! 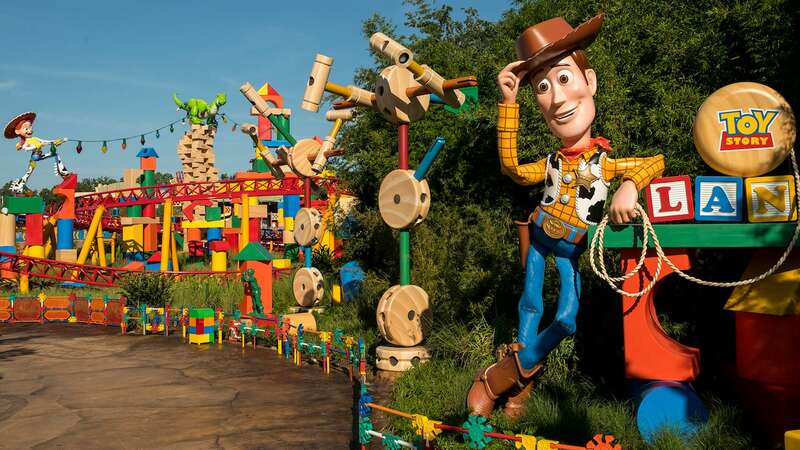 Not sure why anyone but runners need this information so I appreciate the course information hasn’t been shared, it makes me feel Disney is taking Security seriously. Getting it at the Expo is plenty of time before race day. The two gray men’s tech shirts look great! Is the one on the left for Disneyland Paris and not tied to the specific race? 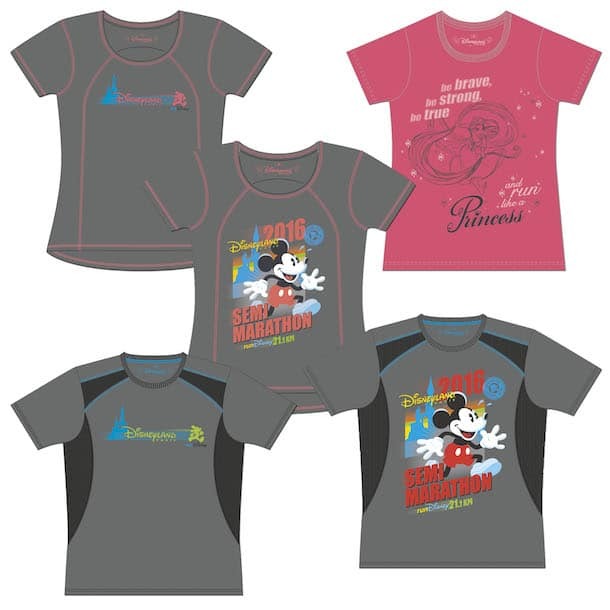 I love the idea of tech shirts that are resort specific and not race specific! Thanks for the sneak peek! Always appreciate the information you provide, Steven. Any chance for a “first look” at the event guide and/or course maps? The event starts in 9 days, and we have yet to see any meaningful details about what to expect.